I’ve been reading up on Melbourne; in particular it’s past and the people who had both of their hands in making the city as special as it is today. I’ve got plans to tell you all about it soon enough, but before I do I thought I’d share a little bit about a couple of the more important historical buildings that help to form the CBD. You may be familiar with this building if you’ve taken a look over on my Instagram. Sarah and Matt’s apartment overlooks Carlton Gardens where the Royal Exhibition Building is located. I’ve not heard anyone actually refer to it as the REB but it wouldn’t surprise me, knowing how keen Australians are on their abbreviations. 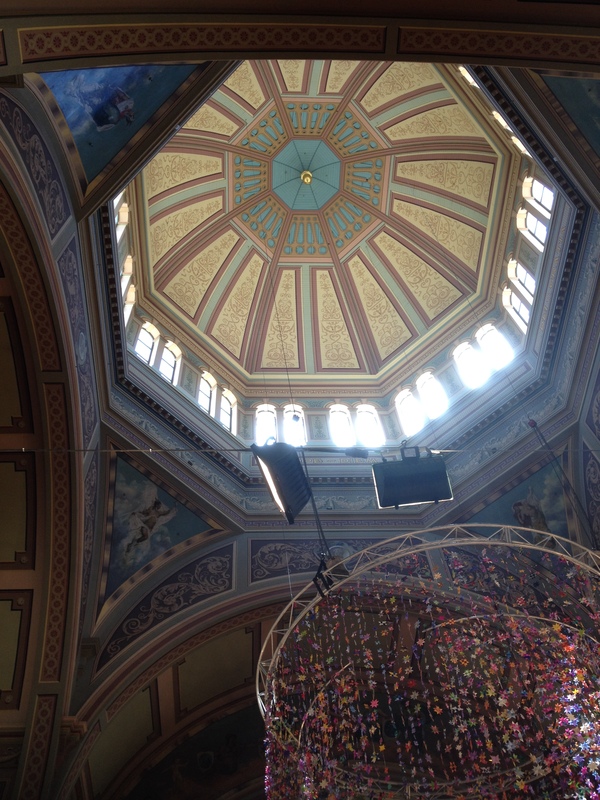 Built in the late 1800s following the Victorian Gold Rush, it has been used as an exhibition centre, has hosted parliament and been used as an exam hall for the local universities. Throughout the 20th Century, fires and questionable government decisions have led to demolition and damage to the building; including the removal of the grand ball room. This left me wondering how much more spectacular it could have looked, if the entire building had survived. There’s a lithograph over on the Wikipedia page that gives you an idea if you’re interested. 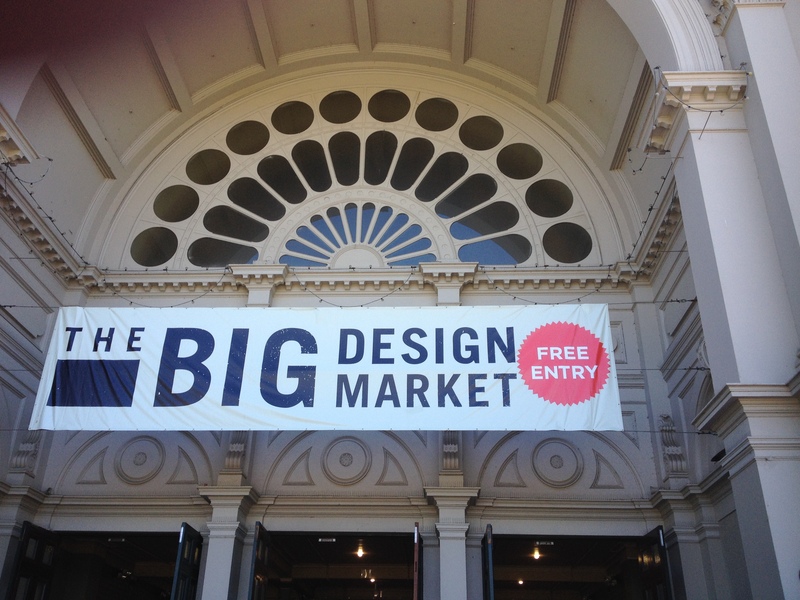 On Saturday morning, a cheeky photo on Twitter from @Melbourne gave me the push to head over and check the Big Design Market and the interior of the building. Along with my house mate Elena, I walked over in some much needed glorious Melbourne sunshine. 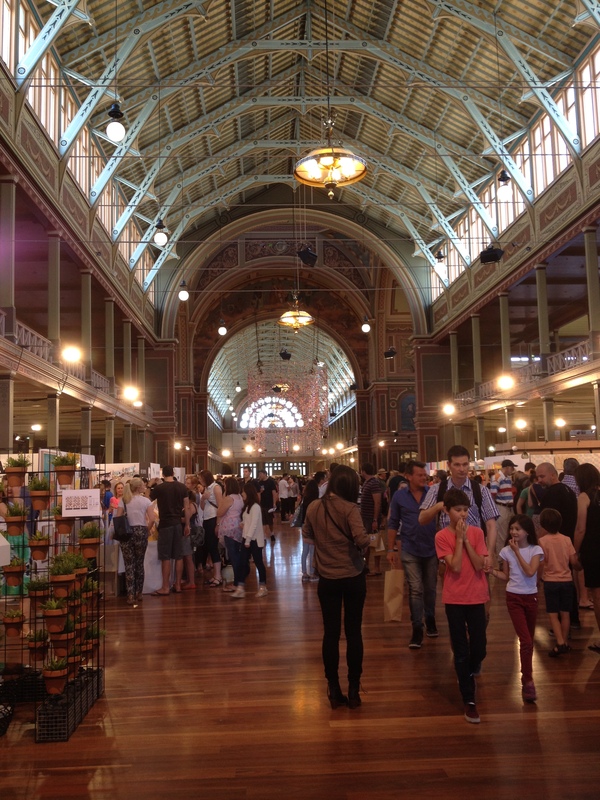 We wandered around the stalls, looking at some pretty hip, dangerously expensive products available. I nearly parted with $75 for the best looking stuffed Yeti I have ever seen. Fortunately, beer sense kicked in and I passed it up in favour of a few drinks at another time. 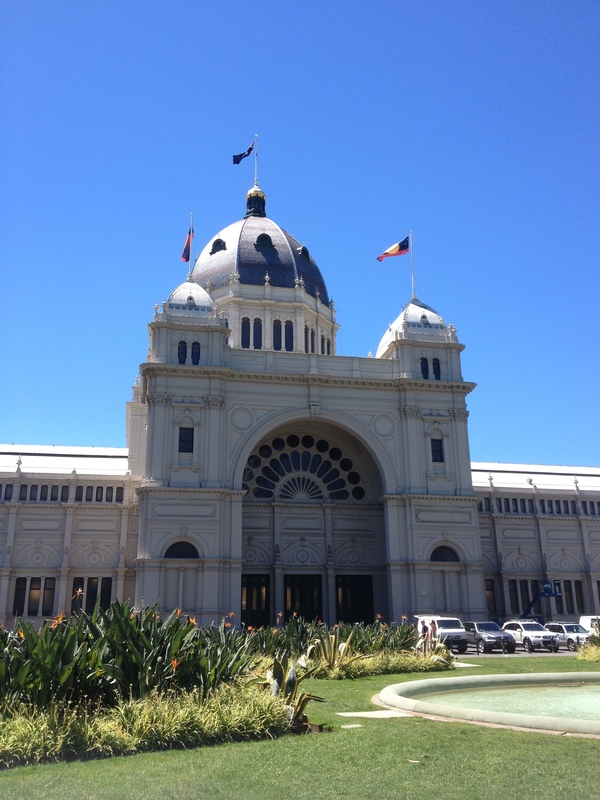 Now a UNESCO heritage site, as being one of the few remaining exhibition buildings of it’s time, it stands out as one of the more spectacular buildings within Melbourne’s city centre. From the outside with it’s appearance reminiscent of St Paul’s and the United States Capitol building I was expecting the inside to be marble and granite, maybe even obscenely extravagant and yet it was none of the above. A smooth wooden floor, high panelled ceilings and a modest amount of paint it was spectacular in a minimalist way. It was only under the dome where there was any sense of decadence in design. I took a fair amount of pleasure enjoying the building as much as the wares on display. It helped that the building was free and would probably remain a part of my memories for much longer than a $400 pair of sunglasses made out of an old skateboard, no matter how cool they may have made me look. 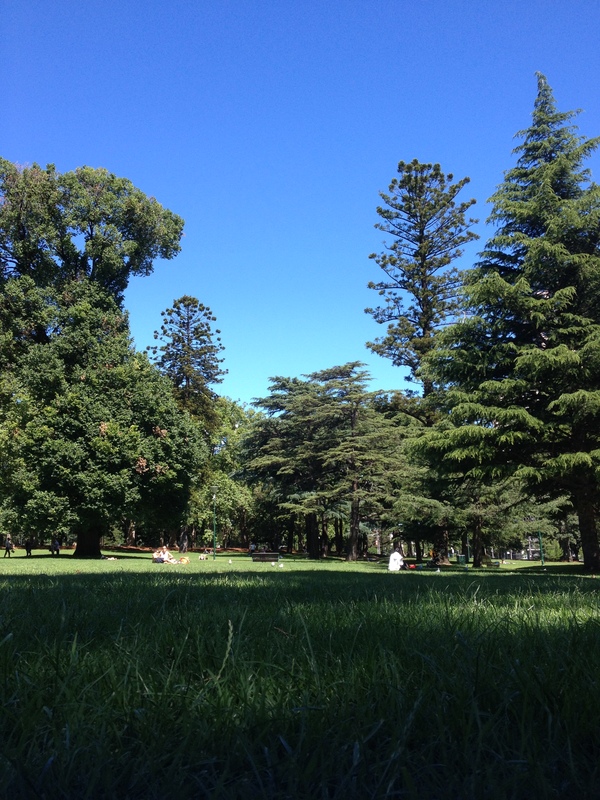 Once we’d had our fill of edgy ideas and summer beards Elena and I chilled in the warm shade in wonderfully green Carlton Gardens. The library is a hotspot for backpackers. Since day one, I’ve been passed, loitered in the gardens and met people here. why? Free wi-fi of course! A chance for a dodgy connection to try and catch up on your emails, Facebook someone you met at the bar the other night to see if they’re still keen on more beers tonight, or just to see what’s happening at home. It’s not a bad place to chill out either. Yes, of course that’s a crane in the background. Everything is always under construction, no matter how long people are claiming it to have been built for. 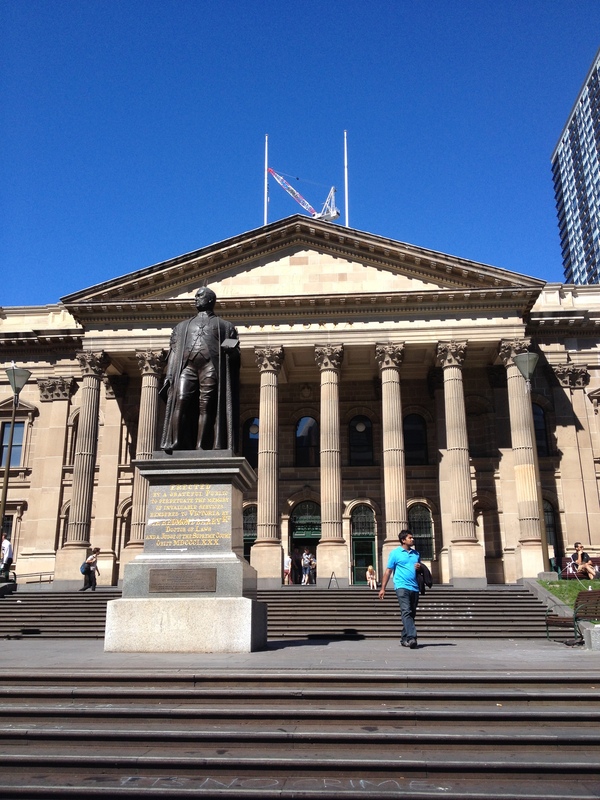 Designed by the same architect as the Royal Exhibition Building, Joseph Reed, the State Library stands as another monument to Melbourne’s ever increasing history. Building commenced a little more than 20 years after the original settlement was founded and opened with a collection of 3,800 books. Not bad for a new town, eh? Despite my loitering around the front, I’d never actually gone into the library before. 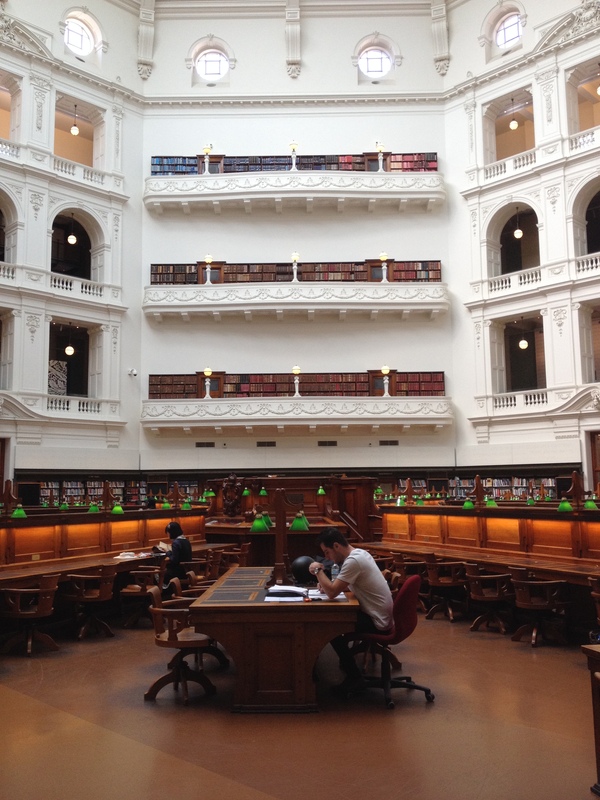 I’d recently seen a picture of the La Trobe reading room and decided that hey, why not pop in and check it out. I actually said out loud “If the library at university was this good, I might have got a first.” This may not be entirely true, but it’s a bloody good job the pub didn’t look as good as this. Within the library walls are also a couple of galleries with landscapes depicting Melbourne during it’s founding and before skyscrapers which when you consider is less than 200 years ago is pretty incredible. 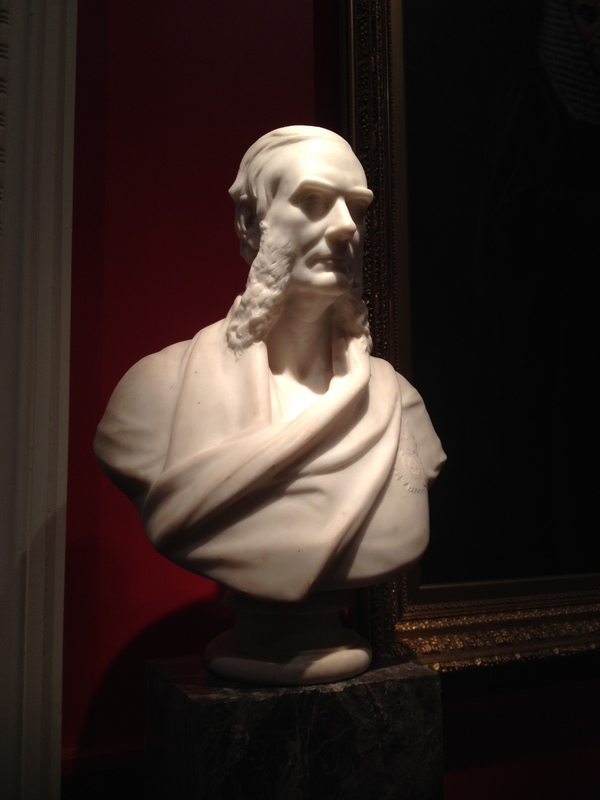 Maybe even more incredible were the mutton chops on one of the busts. In the end, the day left me with a heightened appreciation for the city and it’s past. I know, as if I could possibly like it here any more right? Delving into the architecture a little bit and knowing that these buildings could easily have been knocked down due to non-compliance with health and safety or due to their disrepair. You’ve got to give it to the city for doing their best to keep their history alive.